"Schedule Optimization: Take Advantage in Field Service Industry"
One of the major challenges in many businesses is not just to achieve a break free business flow, but also to move away from the 'break-fix' model and to one of continuous preventative, predictive maintenance. Field service industries have harnessed the optimized scheduling technology to promote a better work force environment and handle all the complex issues in providing support to customers and clients, while also controlling costs, improving efficiency and productivity, softening demand fluctuations and improving customer service levels. 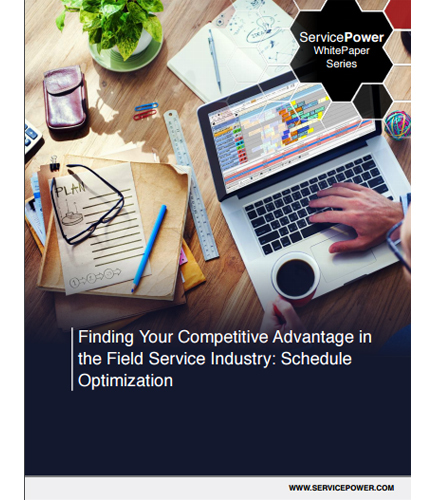 Optimized Scheduling is the key to achieving competitive advantage in field service industry. Intelligent, configurable optimized scheduling software platforms provide the backbone to support evolution to new business models based on emerging technologies, and the challenges associated with them. ​What are the challenges faced by field service organizations? ​What are the benefits offered by service scheduling? What are the key criteria that buyers of optimized scheduling software must consider? What is Service scheduling and how does it help business in adapting to the changing customer demands? Download this whitepaper to learn more about Service scheduling optimization technology and how it enables field service organizations to dynamically adjust the day’s schedule in real-time, reducing job durations, travel times and overall schedule costs.